"The coalition nature of the Republican party, plus the desire on the part of most leaders to nominate an individual attractive to the Whigs and nativists, began eliminating other Republican presidential hope­fuls. Salmon P. Chase longed for the nomination, but he was far more radical than Seward on the slavery issue and thus alienated the conser­vatives. Edward Bates of Missouri, on the other hand, was too conser­vative. A leader of Missouri's Know-Nothings, Bates had a poor reputa­tion among the former Democrats in the Republican camp, and he also repelled German immigrants, who constituted an important part of the organization in the Midwest. Simon Cameron of Pennsylvania also mounted an effort to win the nomination. He had some strong points­ -- he led an important portion of the Pennsylvania party, his appeal in the Keystone State was undisputed, and his political ancestry was Democratic. But the Andrew Curtin-Henry C. Carey clique of the state's Republican (People's) party undermined Cameron's bid. Besides the state rivalry between the two groups, Cameron's reputation for honesty was low. The government corruption that seemed to follow his steps ham­pered his attractiveness. "As the requirement for unifying the Republican coalition began nar­rowing the field of possible nominees, the less-acclaimed leaders of the party became more serious contenders. This was the case of Abraham Lincoln. Despite his 1858 debates with Douglas and a speaking tour in the East in January, 1860, Lincoln lacked a national following. His chief deficiency was his inexperience in national affairs, for his total firsthand knowledge of congressional business came from one stint as an Illinois representative from 1846 to 1848. 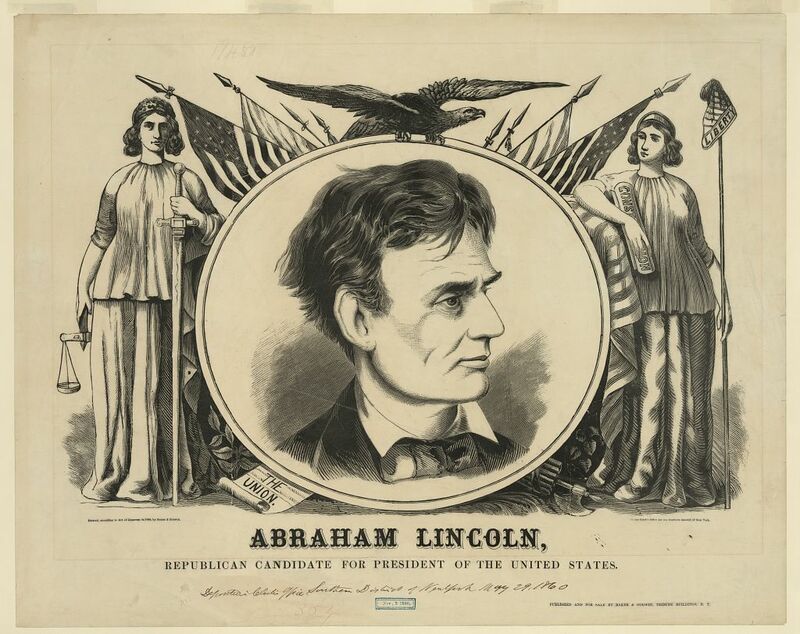 "But whatever Lincoln lacked in national qualifications, he more than made up for in party credentials. Lincoln fitted the coalition re­quirements of the Republicans perfectly. He hailed from one of the doubtful states, and he was able to unite all the wings of Illinois Re­publicanism behind his candidacy, as evidenced in his two campaign managers: David Davis, a former Whig, and Norman B. Judd, an ex-Democrat. Moreover, Lincoln appealed to both conservatives and anti­slavery zealots. As a former admirer of Henry Clay and a strong be­liever in constitutional government, Lincoln attracted conservatives. For his refusal to lower the antislavery standards of the party in his struggle against Douglas, however, Lincoln obtained the gratitude of former Democrats. This special quality of Lincoln was succinctly pointed out by the Chicago Press and Tribune: Lincoln had 'that radi­calism which a keen insight into the meaning of the anti-slavery conflict, is sure to give,' yet he also embodied 'constitutional conservatism.' "